Tripp Lite 3 phase Switched PDU / Power Distribution Unit offers advanced network control and monitoring with the ability to turn on, turn off, recycle or lock-out power to each individual receptacle, monitor site electrical conditions and remotely monitor output power consumption per-phase or per-receptacle. PowerAlert interface supports remote control and custom notification of user-specified conditions via email, secure web, SNMP, Telnet or SSH interface. Individually switched outlets can be controlled in real-time to remotely reboot unresponsive network hardware, or be custom programmed for user-defined power-up and power-down sequences to ensure proper startup of interdependent IT systems and prevent inrush-related overloads as network equipment is first energized. Unused PDU outlets can be electronically locked off to prevent the connection of unauthorized hardware. Built-in local digital display and remote web/network interface reports detailed voltage, amperage and kilowatt output values per outlet, per breaker bank and per phase with additional reporting options for power unbalance percentage, IP address and sensor based temperature and humidity data (requires ENVIROSENSE sensor). Featuring a built-in SNMPWEBCARD, Tripp Lite's PDU3VSR6G30 3-Phase Switched Power Distribution Unit provides full remote power monitoring via a secure network or web browser interface, giving IT personnel around-the-clock oversight of facility power from any location. It’s an efficient way to distribute, monitor and manage power in a data center environment. The PDU3VSR6G30 offers the ability to individually control 30 outlets from a remote location and has a digital meter that displays voltage, frequency and load levels for on-site monitoring. A built-in SNMPWEBCARD enables full remote access for power monitoring, configuration and control via a secure network or web browser interface. Tiered access privileges allow both an administrator and a guest to log in and monitor the PDU via a web browser interface. It supports notification of all major power events and user-specified alarm thresholds via email or SNMP traps. Real-time clock backup maintains the time of day and date even if the PDU is shut down and unpowered. When used with an optional ENVIROSENSE sensor, the PDU3VSR6G30 can also remotely monitor temperature/humidity conditions and provide rack access notification for up to four SRSWITCH door sensors or user-supplied contact closure sensors. The PDU3VSR6G30 provides 10/100 Mbps auto-sensing for optimal communication compatibility with a current 10/100 Base-T network. Protocols supported include HTTP, HTTPS, PowerAlert® Network Management System, SMTP, SNMPv1, SNMPv2, SNMPv3, Telnet, SSH, FTP, DHCP, BOOTP and NTP. DHCP/Manual configuration support provides the ability to have network settings automatically assigned to the card or manually assigned via permanent IP addresses. 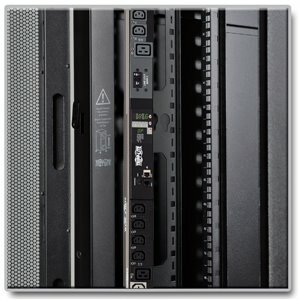 Unfiltered electrical pass-through makes the PDU3VSR6G30 ideal for distributing alternate waveform utility, UPS or generator power in rack enclosures and network closets. It provides 200/208/240V power service via 30 total outlets in three separately breakered 20A single-phase load banks: 24 C13 outlets and 6 C19. Attach the included plastic sleeves to your device plugs for an extra-secure plug-to-outlet connection. This PDU has a rugged all-metal housing and a 6 ft. cord with IEC-309 Blue 30A input. Load capacity is 10kW. The PDU3VSR6G30 is equipped with a digital meter that allows IT personnel to monitor in real time (either locally or remotely) the input voltage, frequency and load levels per bank, per phase and per outlet. It has a pushbutton for scrolling through power consumption for each phase or outlet. The display is illuminated and rotates 180°. The meter helps ensure that the PDU is used at maximum capacity without danger of overload. The meter can also show the IP address. Each outlet has an LED that illuminates to confirm power on/off status. The PDU3VSR6G30’s 30 outlets (24 C13 and 6 C19) are individually controllable via network or web browser interface, providing a higher level of network power control. These controllable outlets enable power management tasks, such as load shedding, load ramping, programming power-on and power-off sequences, and rebooting of locked-up network devices, to be performed remotely. Unused outlets can be disabled to prevent the connection of unauthorized equipment loads. The PDU3VSR6G30 is easy to integrate with a wide range of data center and network applications. It can be configured for 0U (vertical) rack installation with the included mounting brackets, and it also supports toolless button-mount vertical installation in compatible rack enclosures. Vertical 0U installation reduces cord clutter and promotes efficient airflow through the rack. The PDU3VSR6G30 is compliant with the Federal Trade Agreements Act (TAA) for GSA Schedule purchases. The PDU3VSR6G30 comes backed by a 2-year warranty. It’s manufactured in compliance with strict RoHS specifications, reflecting Tripp Lite’s commitment to environmental responsibility.